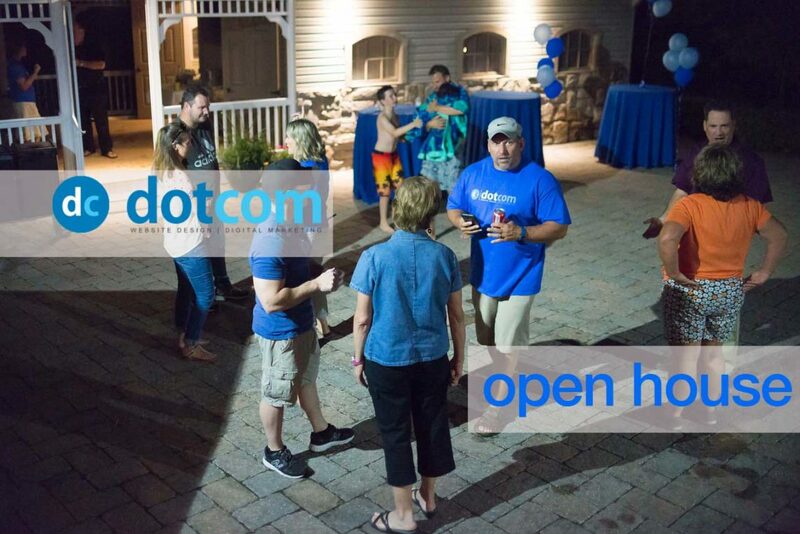 Last week, people came from near and far to attend DotCom’s midsummer Open House. 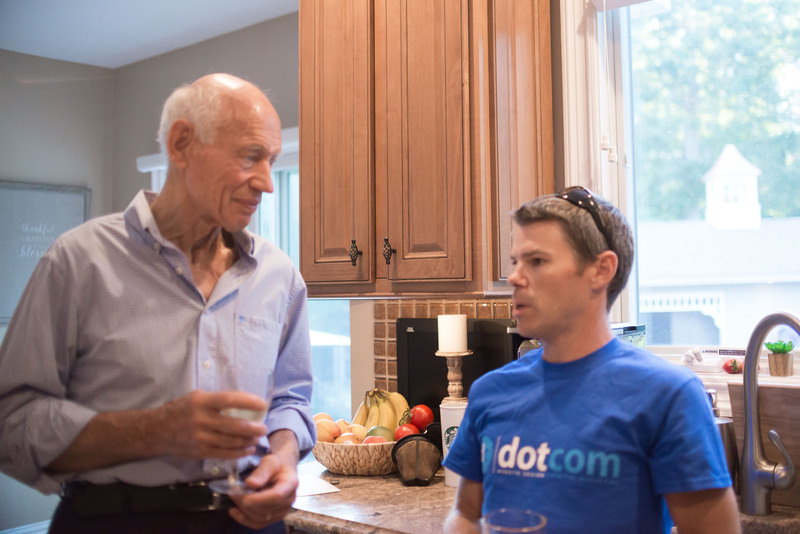 Business owners, entrepreneurs, clients, friends, and relatives all gathered together at the new DotCom HQ in Mays Landing, NJ. 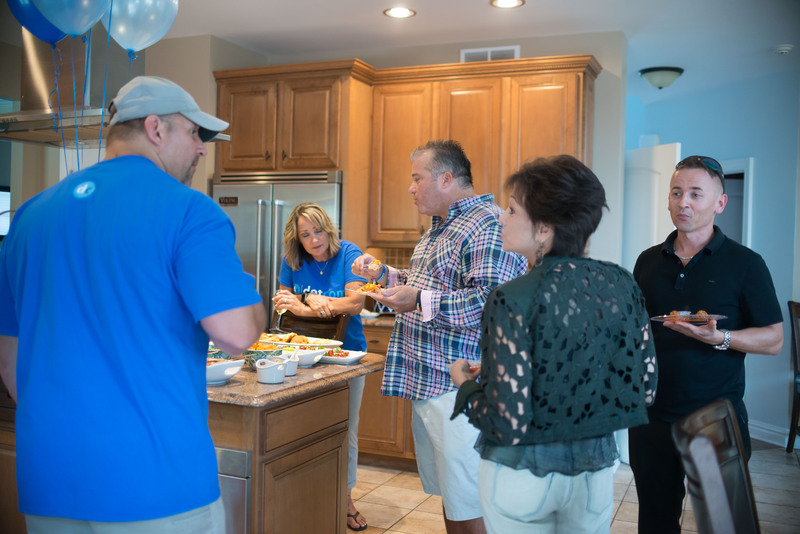 The main goal of this event was to officially celebrate the move and show off the new location, but it was also a perfect opportunity to connect with guests and spend time together. It evolved into a great Mays Landing Networking Mixer! DotCom’s owner Sam Natello considers the new location to be a welcome upgrade for his business and for his family. He and his wife have two teenaged children at home, along with two dogs. Previously, they lived at a small house at Somers Point and the company had outgrown the office space, especially as the onsite team expanded. There is more room for personal and professional use in the new 3,500 square foot location. “This place is such a blessing,” Sam noted, gratefully. 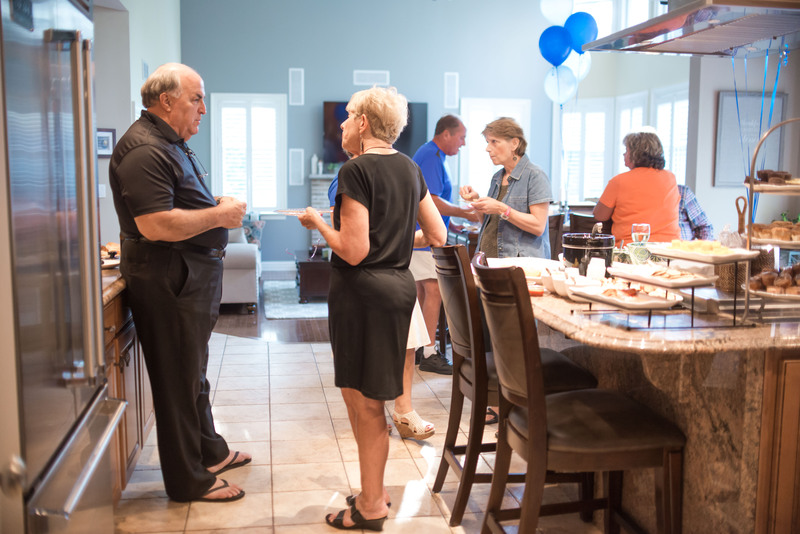 “We wanted to put a nice housewarming party together to show our friends where we are now. I’m just thankful for how much we’ve grown and for all of the space in this beautiful house. 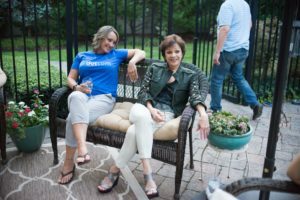 We are very happy here.” The Mays Landing Networking Mixer was great success and everyone seemed to enjoy themselves and get to know each other on a more personal level. 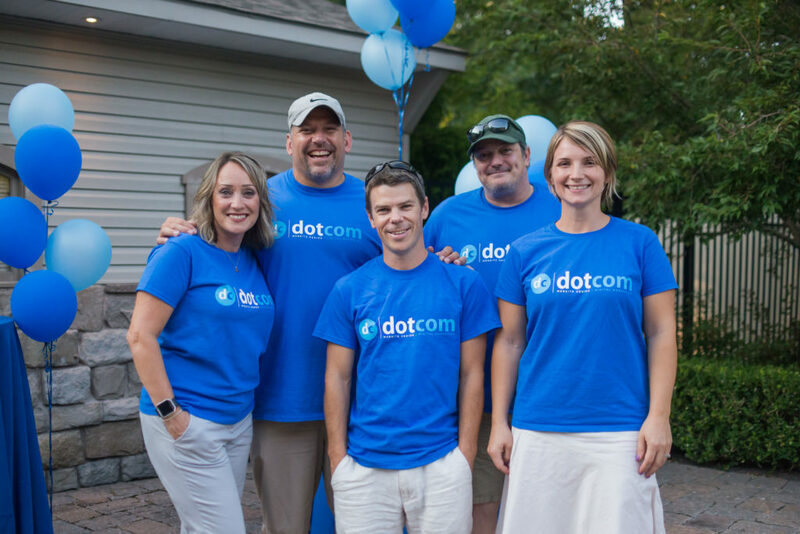 It was easy to spot the DotCom Global Media employees who were wearing blue tee shirts to display the newly redesigned logo. Pictured here, from right to left: Anna Natello, Sam Natello, Andy MacPherson, Ed Yesko, Rhapsody Hahn-Chaney. Inside of the expansive house, space is divided up into residential and commercial areas. On the main floor, there are spacious areas for entertaining guests, meeting with clients, and taking business calls. Beautiful elements throughout the house add to the allure, like the water wall in the foyer and the high ceilings and built-in fireplace in the living room. The kitchen features granite countertops, custom cabinetry, and a hibachi grill. Upstairs, there are six bedrooms, two bathrooms and multiple storage areas. A luxury homes builder built this breathtaking house in 2008, and he spared no expense on the construction. The large house is equipped with high end features and a breathtaking modern design. The pristine exterior and a backyard complete with an in-ground heated pool, water slide, and a four-room pool house. There are several lounge areas and a fire pit, and two sets of cast iron gates to section off the space in the yard. Clients travelled from as far as Kansas City, Connecticut, and Western Pennsylvania to attend the DotCom Open House and Mays Landing Networking Event. Family members and friends drove from all over the state. Sam and Anna were both honored and surprised by the turnout. 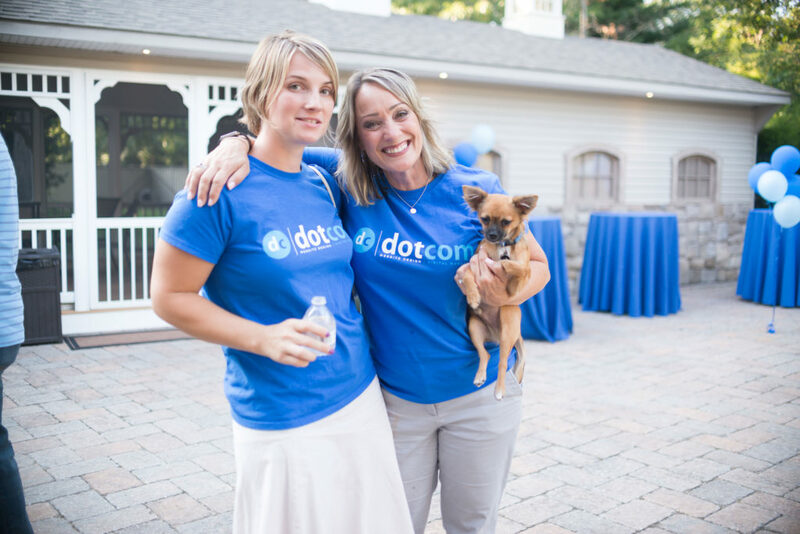 To make sure you’re in the loop for the next DotCom business event or Mays Landing Networking Mixer, subscribe to the DotCom Global Media Newsletter or contact the DotCom team and ask how to get your name added to the guest list!